Vietnam News Agency file photo shows bronze drums designated for Hanoi’s millennium anniversary this October. 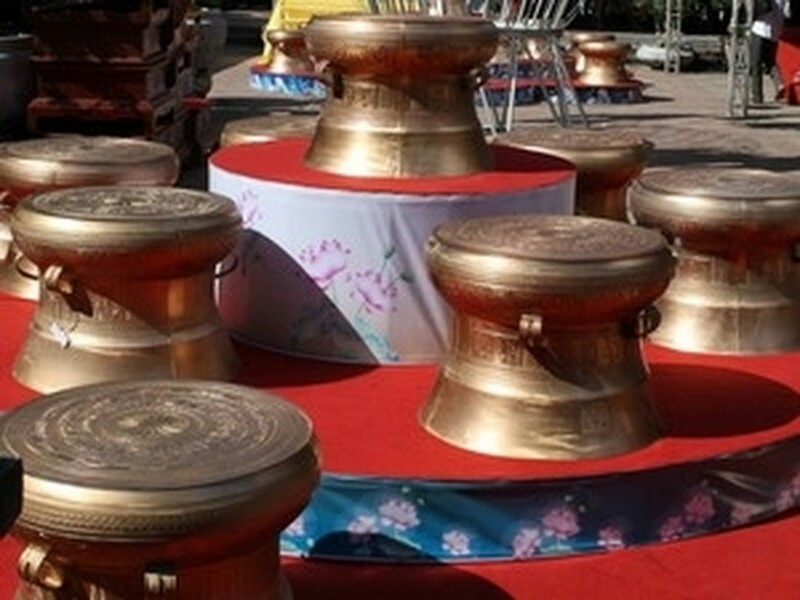 A ceremony was held in Dong Tien commune, Dong Son District, the northern province of Thanh Hoa on September 11 to kick off the casting of 100 bronze drums as gifts to Hanoi for its millennium celebrations. Ho Quang Son, Chairman of the Lam Kinh Cultural Heritage Association, said each drum measures 30cm in diameter and 24cm in height and will be decorated with 100 dragons symbolizing 100 offspring of Mother Au Co. The drums will be Thanh Hoa’s only exhibits at the 1,000 the anniversary of Thang Long-Hanoi, he said, adding that businesses, organisations and individuals can register to buy the products as souvenir at the grand celebration. The casting of the drums is conducted by famous artisans Thieu Quang Tung and Nguyen Minh Tuan.